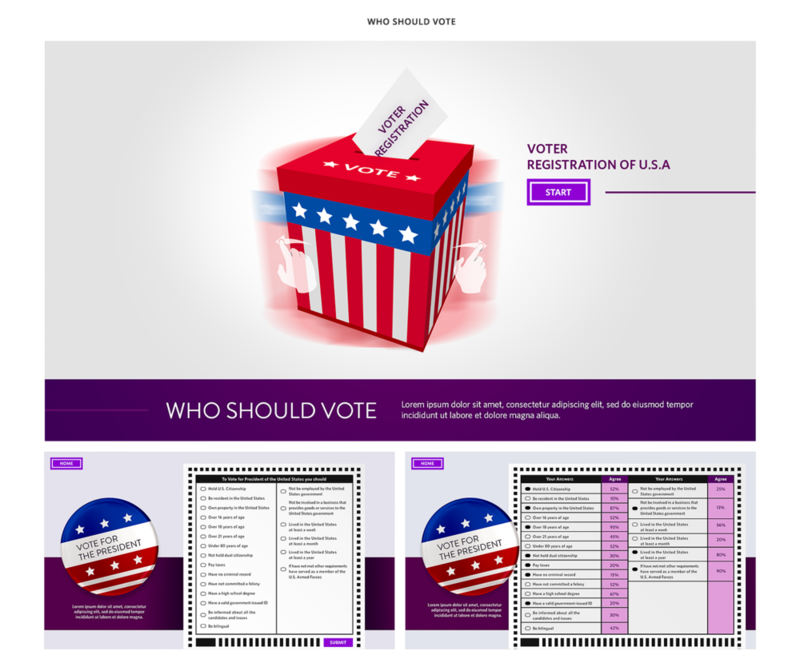 This project includes 6 interactive stations (web/mobile responsive) for the Smithsonian Museum of National History ’s new permanent exhibits - Many Voices One Nation and American Democracy. The exhibits explore the question of “what kind of nation do we want to be” and address the nature of democracy, religion, and immigration. Our interactive stations invite guests to interact with animated paper puppets of the founding fathers, real protest signs, craft the constitution, vote on topics created by the PEW Research Center and presented as whimsical mini-games, page through digital yearbooks, and decide who can vote in various elections. The biggest challenge of this project is - How to make history fun? When visitors are in a history museum, what are they expecting? After brainstorming and doing some visitor researches, We found some common problems of historical content/experience, and started from there, we came up some potential solutions to guide us to next steps. For each program, I tried to build different scenarios for different content, so that the visitors could understand the historical content in a more delight and contextual way. For example, in Great Debate, visitors will be dropped into a debate featuring the founding fathers. The program will begin with an introduction of “Why Not Democracy” and the difference how participatory the republic should be. The intro screen will be filled with animated puppets of the founding fathers talking and debating with voice bubbles. A quotation is then presented, with a group of animated founders puppets below. Visitors must swipe to agree or disagree with the quotation. After the visitor makes their choice the founder who made the statement will identify himself from the crowd of other animated founding fathers. Another example, In the Digital Yearbook interactive, guests can peruse yearbook pages from a variety of school settings. Each yearbook page will display a single school setting. Content will include, text, audio, video, and images. Each page will be styled to represent the time period and culture of that school setting. Pages will be “turnable” on screen.